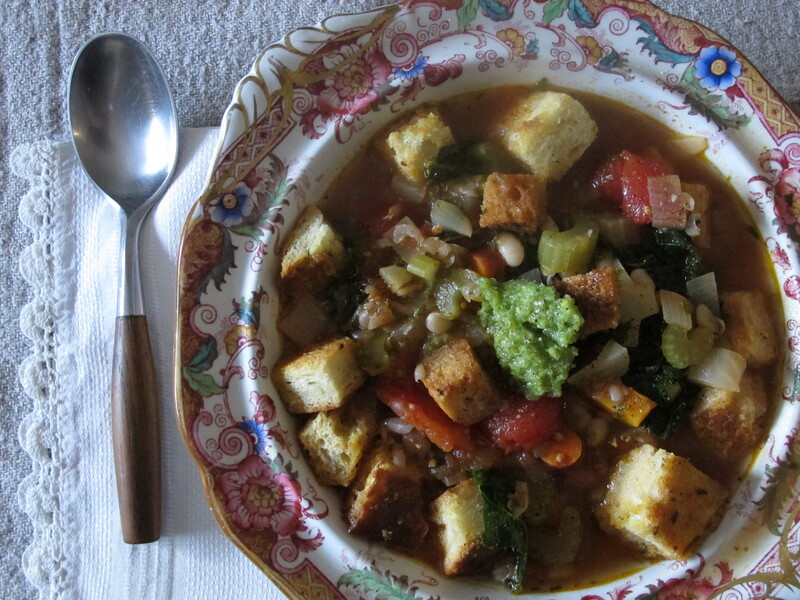 Ribolitta is a famous Tuscan soup, or potage. It almost always contains stale bread and beans, and a healthy portion of various veggies like carrots, celery, cabbage, cavolo nero, and onions. It literally means “reboiled” and embodies all the best of peasant food which, for me, equals frugality and simplicity but not at the expense of taste and artistry. Let the uber-chefs have their emulsified this and that; I’ll take good hearty farmstead food any day. This is a variation on the traditional Ribollita, if you can call it that. I’m sure every variation is a variation and there is no “pure” original. Build a base soup and add garlic rosemary croutons, a bit of garlic scape or sun-dried tomato pesto, and a drizzle of some really good quality Tuscan olive oil. No wonder Alice in Wonderland said “Beautiful soup! Who cares for fish, game or any other dish? Who would not give all else for two pennyworth of beautiful soup?” It’s all love…. Heat olive oil in a large dutch oven or heavy pot. Add chopped onion and fennel and sauté for about 5 minutes over medium-high until they begin to get tender. Add carrots and celery and continue to sauté for another 4 or 5 mintues, stirring ocassionally. Stir in the tomato paste and mix well. Add the wine, bring to a boil, and then let simmer for a couple of minutes. Add plum tomatoes with their juices, herbs, sugar, and stock. Add some sea salt and pepper to taste. Bring to a boil and let simmer for about 30 minutes. Meanwhile, heat the oven to 350 degrees. Chop the stale bread into large chunks. In a large mixing bowl, toss bread chunks with olive oil, rosemary, garlic, sea salt and pepper. Place on a cookie sheet and bake in the oven for about 10 minutes until the bread is nicely browned and crispy. Remove from the oven and set aside. Place half the beans in a bowl and smash them with a potato masher. Add them, as well as the other half of the beans, to the soup. Add chopped kale. Let simmer for about 5 or 10 minutes. Adjust sea salt and pepper to taste. To serve, place a small handful of garlic croutons in the bottom of a soup bowl. Ladle a good portion of ribollita over the croutons. Add a dollop of pesto on the top and a healthy drizzle of really good Tuscan olive oil. Serve hot and be forever grateful for the wonder that is soup.